Mouldings With over 60 different styles to choose from, Cherokee Wood Products is a leading distributor in Southern California for hardwood, MDF and specialty moulding. Depending on your preferences and needs, we offer a large selection of of hardwood species like Red Oak, Maple, Poplar, Cherry and Alder. In addition, Cherokee Wood Products is one of the few distributors in Southern California to offer both Lyptus and European Steemed Beech to our customers. With a full service mill adjacent to our warehouse, we can also produce any custom moulding, in any species in the quantity you need. Having the most sophisticated computers and machinery helps us create whatever it is you are looking for; from custom crown, baseboard and chair rail to stiles and rails for cabinet doors and everything else in between. Cherokee Wood Products has also developed excellent relationships with other moulding houses like White River, El & EL Wood Products & Ekena Millworks to offer you the wide range of species & design including value flex & polyurethane. Baseboards are used where the wall joins the floor and are excellent when turned upside-down and used with Crown to form larger crown details. 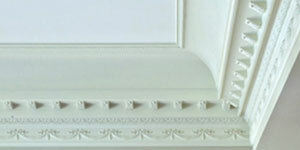 Crown Moulding is used where the wall joins the ceiling. 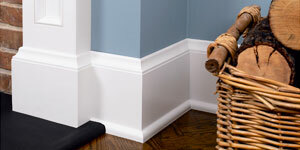 Crown mouldings can be used alone or built up using lineal mouldings, such as baseboards, casings, chair rails or panel mouldings, to create larger details and unique designs. 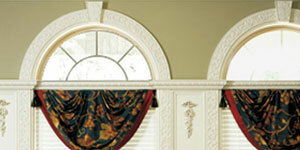 Casings are used to trim around doors and windows. Casings can also be used as large chair rails, or upper horizontal linear banding around rooms. Chair rails are used approximately 30′ to 40′ from the floor, running horizontally to form a “wainscot” look. 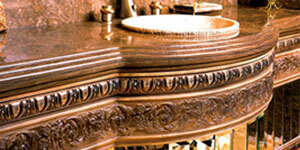 They can also be used as panel molding to form panels on walls or ceilings. 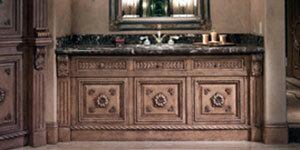 Panel Molds, Nose & Cove, Bar Rail, Half Round, Quarter Round, Outside Corner, Cove, Base Shoe, Scribe, Clover & more..
White River™ is the Leader in the Design and Manufacture of Embellished Hardwood and Handcarved Woodcarvings for the Millwork and Kitchen & Bath Industries.